THIS Plate represents a wood Boudoir, painted in grey-white, and decorated with mirrors. 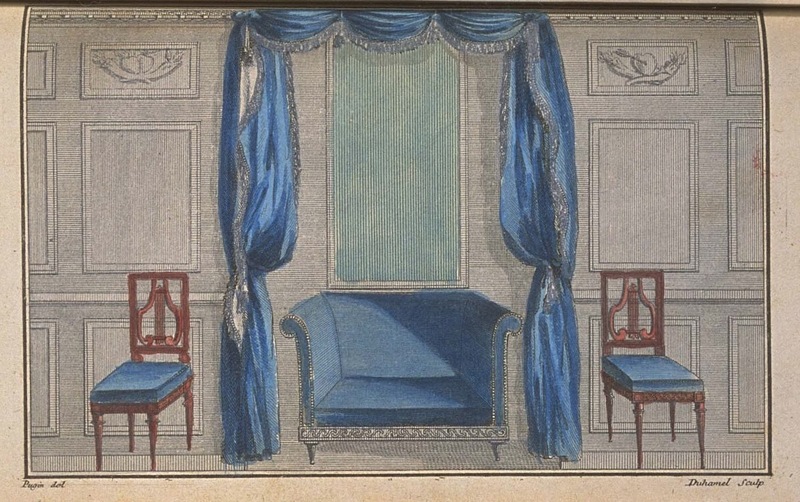 In the most convenient place a rather deep niche is made, at the top of which is attached a drapery of blue Pekin, trimmed with fringe and tassels, and which falls rather low; the outer sides are decorated with draperies, tied at intervals with tassels. Under these draperies are curtains, which are pulled up with tassels. The bottom of the niche is decorated with a mirror which rises to the ceiling, and which reflects the draperies. Under the mirror, which descends very low, is a seat with three backrests, that is called a Turquoise. This seat is decorated with a square [cushion?] and two cushions covered with the same fabric as the draperies. On two sides of the niche is a lyre Chair in rosewood, and whose seat is also covered with the same fabric. 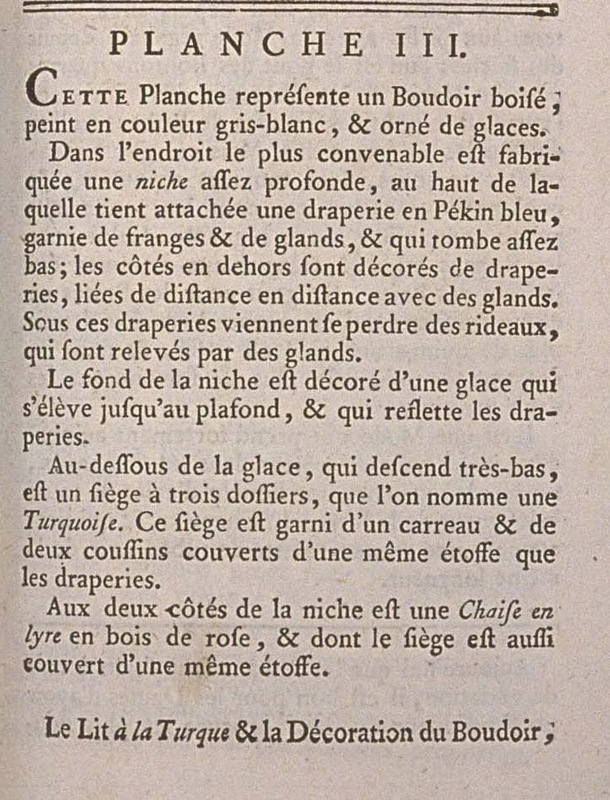 The Bed à la Turque and the Boudoir Decoration are drawn from the Shop of M. Bouché, Merchant Upholsterer, at the gold Eagle, rue de la Verrerie. 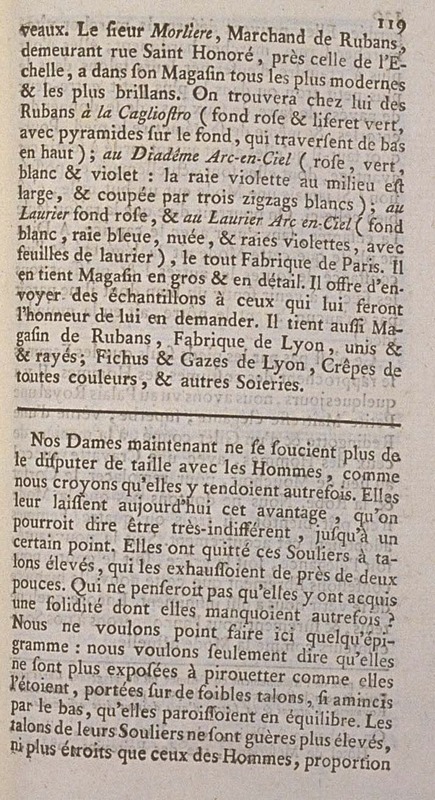 His Furniture Shop is well-known in Paris; but he has some fabrics of the most beautiful Manufactures, which do not merit less than being known as that. One finds there the richest and best made objects. There are some which compose almost a dozen pieces. Two bizarre tastes have been struggling with the reigning Fashion for centuries: one is the taste for squared buttons for Men's Coats and Hats; and the other is the taste for Tufts of Ribbons in place of garter Buckles. But these always reappearing tastes are always repelled, and we do not believe that we should ever announce them as reigning Fashions. That for Ribbons is already relegated to men who wear boots. This taste for Boots is a third one which is beginning to be reborn since the more than fifteen years that it passed, and we do not believe that it will have more luck than the first two. There is a Fashion which is strongly taking today: it is that of wearing on Hats, on the left side, a steel Buckle as long as the crown of the Hat, and which holds a large bow of black ribbon of the same length. Today Ribbons are subject to such variation, that it is good for Women to have a Furnisher who procures the newest ones for them. 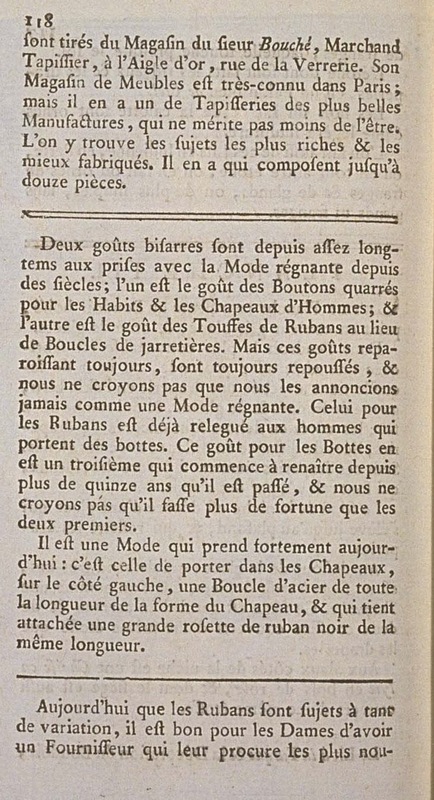 M. Morlière, Merchant of Ribbons, residing in the rue St. Honoré, near that of l'Echelle, has in his Shop all the most modern and the most brilliant. One will find in his shop Ribbons à la Cagliostro (pink ground and green edge, with pyramids on the ground, which go from the bottom to the top); au Diadême Arc-en-Ciel (pink, green, white, and purple: the purple stripe in the middle is wide, and cut with three white zig-zags); au Laurier with a pink ground, and Au Laurier Arc-en-Ciel (white ground, blue stripe, clouded, and purple stripes, with laurel leaves), all Made in Paris. He holds a Store of them for wholesale and retail. He offers to send samples to those who will make him the honor of asking him for them. He also has a Store of Ribbons, Made in Lyons, plain and striped; Kerchiefs and Gauzes of Lyons, Crêpes in all colors, and other Silks. Our Women now care no longer for competing with Men for size, as we believe that they tended to at other times. They concede them this advantage today, so that that one could say they are very indifferent, up to a certain point. They have abandoned these Shoes with raised heels, which raised them nearly two inches. Who wouldn't think that they acquired a solidity that was lost at other times? We don't want to make an epigram here: we only want to say that they are no longer exposed to spinning as they had been, carried on weak heels, so narrowed at the bottom, that they seemed to be balancing. The heels of their Shoes are hardly higher, nor narrower than those of Men, proportionally. They can henceforth walk quickly, walk firmly, walk boldly; they no longer fear catching their heels in the smallest hole or in the smallest cracks between paving stones, making a false step, giving themselves sprains, and even twisting a foot. Why must it be that they had to wait so long to feel this advantage, which they are actually in possession of? If ever a Fashion had a useful goal, it must be this one. One could call that the only reason it was born, without joining with caprice. God forbid that this Fashion had the lightness and inconstancy of all the others! and that all the centuries could come to feel a good of which it seems that nobody, before us, had had the least idea! It is not in the feet only that Women approach Men's dress. 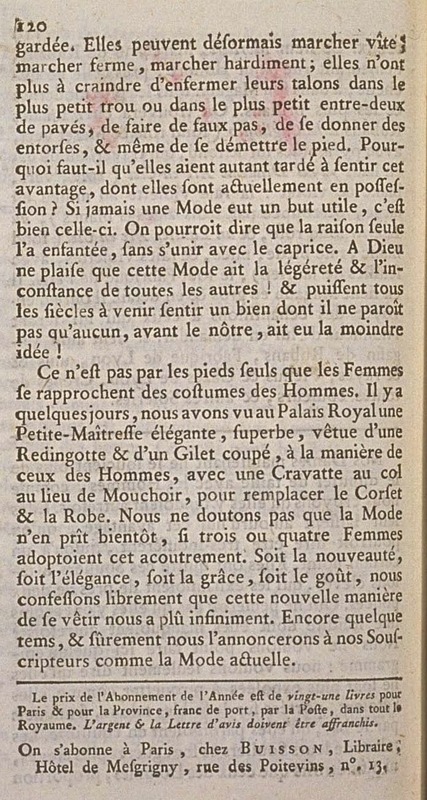 For some days, we have seen at the Palais Royal an elegant Petite-Maîtresse, superb, dressed in a Redingote and a different-colored Gilet, like Men's, with a Cravat at the neck in place of a Handkerchief, to replace the Corset and the Gown. We do not doubt that Fashion would take soon, if three or four Women adopted this dress. Whether for novelty, for elegance, for grace, or for taste, we freely confess that this new manner of dressing pleased us infinitely. Still some time, and surely we will announce it to our Subscribers as the current Fashion.